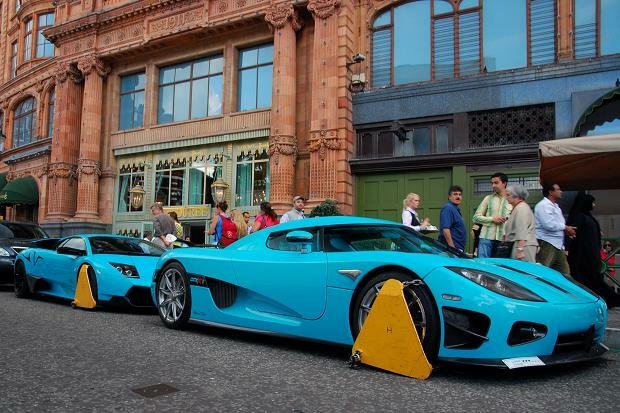 Whichever clamper did his job so well and clamped these vulgar, gratuitous and hideous cars deserves an O.B.E. I can’t tell you how much I smirked when I saw this picture. One car is a Koenigsegg CCXR and the other a Lamborghini Murcielago LP670-4 SuperVeloce. Both are clearly whopping substitutes for men fearful that their ‘down below’ bits are woefully inadequate. The cars belong to members of the Qatari Royal Family, the new owners of Harrods in London. A belated and appreciating hat tip to the eponymous Windy City Iman. Brilliant scoop- funny how this hasn’t been in the papers round here! Thanks for the laugh!